The Wi-Fi version of the Samsung Galaxy Tab 10.1 went on sale nationwide Friday, and it seems that the one with cellular connectivity shouldn't be far behind. The Galaxy Tab 10.1 with 850 and 1900MHz bands, plus WCDMA II and V, which are AT&T frequencies, has been submitted for approval at the FCC on June 14th, and permission has been granted on Friday. This is an indication where Samsung's thinnest and lightest 10" tablet is heading some time in the future, but we don't know what price will the Galaxy Tab 10.1 be after AT&T's subsidies. If you buy retail, the 16GB version with wireless connectivity should run you at least $599, judging by other tablets' prices. We don't know if the same HSPA+ radio that is in the Samsung Galaxy S II or the Samsung Infuse 4G is used inside the Galaxy Tab 10.1, then we might even have 21Mbps download speeds. Considering that ITU proclaimed HSPA+ as 4G, as well as AT&T's own definitions, where even the HTC Inspire 4G, for instance, which has 14.4Mbps download speeds, is being called "4G", the tablet could very well be marketed as such - it's hard to believe that Samsung will place 7.7Mbits or slower radio inside. In the FCC filing, however, the Galaxy Tab 10.1 has the 3G logo slapped on the back, but we don't know if the FCC is referencing the ITU definitions of 4G at face value. 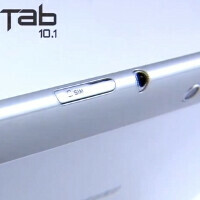 Have a look at the promo video for the Samsung Galaxy Tab 10.1 below to see how the SIM card slot looks like. To be honest, I would have preferred the original 10.1 Galaxy Tab. It had way more features and really stood out! I loved the fact that it had USB ports and expandable memory, 8MP camera etc.. This is just seems like an iPad rip-off. Although it has better specs it just lacks a bit of Samsung's character and I think they can do much better. It seems like many companies are trying to emulate Apple on different fronts(Samsung with pin connector WTF!, Nokia with their secrecy policy, Acer aiming at producing high end tablets etc..) just show a little bit of character and dare to be different like the Asus Eepad Transformer or the Notion Ink Adam.